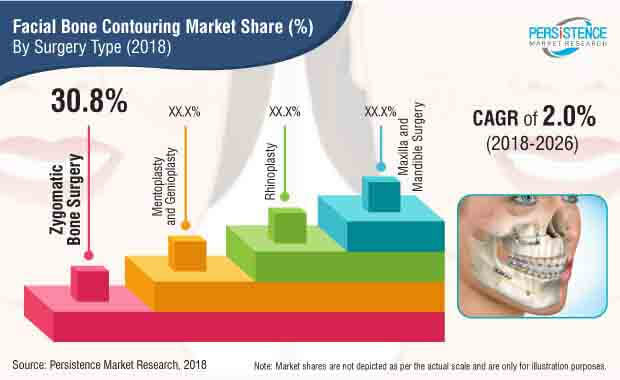 Facial Bone Contouring Market Segmentation By Surgery Type - Zygomatic bone surgery, Mentoplasty & Genioplasty, Rhinoplasty and Maxilla & Mandible surgery; By Region - North America, Latin America, Europe, Asia-Pacific (APAC), and the Middle East & Africa (MEA). A recent market study published by PMR – “Facial Bone Contouring Market: Global Industry Analysis 2013–2017 and Forecast 2018–2026” – consists a comprehensive assessment of the most important market dynamics. On conducting a thorough research on the historic as well as current growth parameters of the Facial bone contouring market, growth prospects of the market are obtained with maximum precision. The report features unique and salient factors that may have a huge impact on the development of the facial bone contouring market during the forecast period. It can help market players to modify their manufacturing and marketing strategies to envisage maximum growth in the facial bone contouring market in the upcoming years. The report provides detailed information about the current and future growth prospects of the facial bone contouring market in the most comprehensive way for the better understanding of readers. The report commences with the executive summary of the Facial bone contouring market, which includes the summary of key findings and key statistics of the market. It also includes the market value (US$ million) estimates of the leading segments of the facial bone contouring market. Readers can find detailed taxonomy and the definition of the Facial bone contouring market in this chapter, which will help readers to understand the basic information about the facial bone contouring market dynamics, supply chain, cost structure, pricing analysis and list of key market participants included in the report. Based on the Surgery type, the Facial bone contouring market is segmented into Zygomatic bone surgery, Mentoplasty & Genioplasty, Rhinoplasty and Maxilla & Mandible surgery. In this chapter, readers can find information about key trends and developments in the facial bone contouring market and market attractive analysis based on the surgery type, Zygomatic bone surgery, Mentoplasty & Genioplasty, Rhinoplasty and Maxilla & Mandible surgery. Based on the end user, the facial bone contouring market is segmented into hospitals and specialty clinics. In this chapter, readers can find information about key trends and developments in the facial bone contouring market and market attractive analysis based on end user. This chapter explains how the facial bone contouring market will grow across various geographic regions, such as North America, Latin America, Europe, Asia-Pacific (APAC), and the Middle East & Africa (MEA). This chapter includes detailed analysis of the growth of the North America Facial bone contouring market along with the country-wise assessment including the U.S. and Canada. Readers can also find regional trends, regulations, and market growth based on surgery type and countries in the North America facial bone contouring market. Readers can find detailed information about factors such as, pricing analysis, and regional trends that are impacting the growth of the Latin America facial bone contouring market. This chapter also includes the growth prospects of the Facial bone contouring market in leading LATAM countries such as Brazil, Mexico, and Rest of Latin America. Important growth prospects of the facial bone contouring market based on its product types, form, and applications in several European countries, such as Germany, U.K., France, Italy, Spain, Russia, Poland, and Rest of Europe is included in this chapter. China, India, Australia, Japan, and Rest of APAC are the leading countries in the APAC region that are the prime subject of assessment to obtain growth prospects of the APAC facial bone contouring market in this chapter. Readers can find thorough information about the growth parameters of the APAC facial bone contouring market during the period 2018–2026. This chapter provides information on how the facial bone contouring market will grow in the major countries in MEA region, such as GCC Countries, Iran, Turkey, South Africa, and Rest of MEA during the period 2018–2026. This chapter helps readers to understand the research methodology followed to obtain various conclusions, important qualitative information, and quantitative information about the facial bone contouring market. People are indulging in both surgical and non-surgical cosmetic treatments nowadays. People are turning to new and innovative ways to alter the facial imperfections, which consequently has increased the adoption of facial bone contouring surgeries. Facial bone contouring surgeries help in reshaping the face and to alter the underlying bone and contour the facial skeleton in a way that enhances the facial structure. As per a report published by the American Society of Plastic Surgeons, 64% surgeons experienced that there has been a significant increase in facial bone surgery among patients under the age of 30 years. The American Academy of Facial and Plastic Reconstructive Surgery (AAFPRS) claims that according to the surgeon survey conducted, 82% of the surgeons suggest that celebrities have a big role in influencing the patient’s decision to undergo a cosmetic surgery. Maximum number of Rhinoplasty surgeries are performed in Iran. According to a study conducted by the Rhinology Research Society of Iran in co-operation with Johns Hopkins University suggested that Rhinoplasty is performed seven times more than U.S.
Facial bone contouring surgeries are also performed to make corrections in the facial bones, and to improve and repair their functionalities. The facial bone contouring surgeries also find applications in genetic facial disorders or fractures. Correction of a deviated septum is one of the most common causes of breathing impairment. The facial bone surgery adjusts the nasal structure to produce better alignment and helps in normal breathing. Sleep apnea is treated by performing Maxilla & Mandible surgery. According to the WHO, cleft palate defects occur in about one in every 700 infants and is the second most common birth defect in the U.S. The growing incidence of cleft palate defects is expected to propel the demand for facial bone contouring surgeries and drive the growth of the facial bone contouring market. The increasing private expenditure on aesthetic and wellness procedures is projected to increase the demand for facial bone contouring surgeries. This is true in both developing and developed countries. Increased awareness and affordability are factors projected to positively impact the revenue growth of the market. As per the IASPS survey, it was found that the number of aesthetic procedures performed in the developing countries such as Brazil and India is growing, which is also expected to boost the growth of the facial bone contouring market. Aesthetic surgery tourism is a price-driven phenomenon that has contributed to the growth of the facial bone contouring market over the past decade. Many travel & tourism companies offer all-inclusive vacation packages, which also include aesthetic surgery. The cost of facial bone contouring procedures in developed countries has become a hot topic worldwide. Developing economies are attracting patients by building state-of-the-art facilities and by offering various after-surgery services at a cheaper rate than the developed countries. The price difference matters in most of the elective procedures, including facial bone contouring procedures, which are paid for out of pocket. Cosmetic surgery trips are promoted like vocational trips in many countries, e.g., Brazil. Medical tourism is one of the Brazil’s fast growing industries, which attracts people from all over the world seeking affordable, high-quality cosmetic procedures. Facial bone contouring is a surgical alteration of facial bones also known as facial sculpting. It is a cosmetic surgical procedure that improves the aesthetic facial harmony and also corrects few deformities. It is an elective surgical procedure used to improve facial symmetry and to correct facial features. The company conducted a research study on the facial bone contouring market for the forecast period 2018 to 2026. The report offers a comprehensive evaluation of the business opportunities prevailing in the facial bone contouring market along with insights on the facial bone contouring trend, disease incidences, and awareness level for facial bone contouring and facial bone contouring market competition. The report elaborates the macroeconomic factors influencing the dynamics of the facial bone contouring market and its futuristic potential. The report offers a comprehensive taxonomy of the facial bone contouring market based on surgery type, end user and region. The facial bone contouring market is categorized into four types of surgeries that are zygomatic bone surgery, mentoplasty & genioplasty, rhinoplasty and maxilla & mandible surgery. These surgeries are performed in hospitals and specialty clinics for facial bone contouring. The end-use segments in facial bone contouring market which are a part of this facial bone contouring market report include specialty clinics and hospitals. The facial bone contouring market has been analyzed across regions of North America, Latin America, Europe, Asia Pacific (APAC), and MEA. What are the prices of facial bone contouring surgery in facial bone contouring market across regions of North America and Europe? What are the reimbursement scenario across North America & Latin America regions in facial bone contouring market? What are major challenges influencing the growth of facial bone contouring market? How intervention from regulatory authority is shaping the facial bone contouring market growth? The facial bone contouring market has been estimated based on considering number of facial bone contouring procedures. A triangulation methodology is adopted to derive the Facial bone contouring market size, which is primarily based on overall pricing analysis of facial bone contouring procedures , life science research and R&D funding to obtain precise market estimations and insights on life science and biotechnology associated services , products, technologies and applications,. This information is further validated with rigorous primary research (including interviews, surveys, in-person interactions, and viewpoints of seasoned analysts) and secondary research (including verified paid sources, authentic trade journals, and resourceful databases).